The U.S. retail sector is in a period of retrenchment and reinvention. Throughout 2016, retail headlines have been dominated by news of closures, bankruptcies and articles about struggling shopping centers. There has been no shortage of hype as the sector has fallen prey to a negative news cycle. Yet, for every retail category in flat or contraction mode, there has been another in growth mode. This latter crop of retailers is driving occupancy growth in an otherwise challenging environment. It is also driving the next wave of adaptation in the world of retail real estate as properties evolve; formats change and traditional tenant mixes are reinvented. While there are a number of these growth-mode sectors, no other retail category has generated as much aggressive expansion in the past few years as food-related retail. 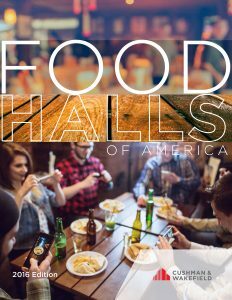 And arguably, there is no hotter trend within that category as food halls.